A wet underfloor heating system is an ideal accompaniment to a Heat Pump driven system as the flow temperatures delivered by the Heat Pump are perfectly matched to the needs of this type of heat source. A radiator system circulates air around the radiator, drawing cooler air across the floor back to the radiator and, more importantly across your feet and legs creating a cooler crafty feel. The warm air circulates up from the radiator toward the ceiling giving a large temperature differential between the floor and the ceiling. 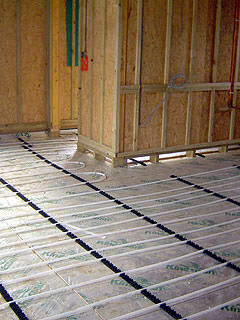 Underfloor heating systems can be installed into solid floors, between joists in heat reflective trays or into almost any floor type. The comfort level obtained with this form of heating is greater as the whole floor becomes the heat source, radiating warmth up from the floor. The temperature difference between the floor and the ceiling is far lower than with radiators giving more even comfort without the draft. All of the components used in our systems are of the highest quality with the manifolds being made of brass with flow gauges, individual flow controls, air vents and a ten year manufacturer’s warranty. The pipework used is also of the highest quality with a fifty year warranty. We can offer you a full design service for underfloor heating systems which are matched to your renewable technology instillation making it a complete integrated package.